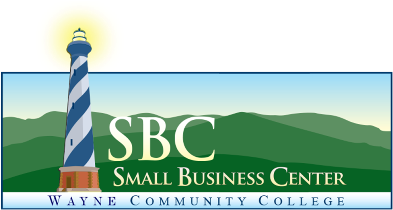 The Small Business Center, part of NC’s dynamic Small Business Center Network, provides one-on-one consulting services, resources, and free seminars. Our goal is to help you realize your dream of owning your own business or making your current business more profitable. The center provides analysis and evaluation to determine our clients’ immediate needs at the Wayne Community College Campus and other off-site locations listed below. Individual attention is provided for those clients who need detailed assistance in starting a business. NOTE: Wayne Community College will be closed on Fridays for the Summer from May 18th – August 9th. 1st Monday of every month 8:30 am to 10:00 am Downtown Goldsboro Development Corporation (DGDC) 219 N. John St.
2nd Tuesday of every month 8:30 am to 12:00 pm Wayne County Chamber of Commerce 308 N. Williams St.
3rd Monday of every month 3:00 pm to 5:00 pm Wayne County Public Library-Goldsboro 1001 E. Ash St.
1st Thursday of every month 9:00 am to 12:00 pm Steele Memorial Library-Mount Olive 119 W. Main St.
*3rd Friday of every month 9:00 am to 12:30 pm Wayne County Library-Fremont Branch 202 N. Goldsboro St.
1st Wednesday of every month 1:00 pm to 4:00 pm NC Works 2006 Wayne Memorial Dr.
Walnut Bldg. Room 108 3000 Wayne Memorial Dr.
*Summer counseling at the Fremont Branch Library will move to Thursdays, from 2:00 p.m. – 5:00 p.m. on May 18th until August 9th. The center maintains various types of business related information and current multi-media resources. Clients may check out these materials by visiting the center. The college library and other college facilities are also available. Additionally on a state and national level there are many online resources to aide you in your business planning. Are you considering a new business venture? Expansion? Or perhaps just need help with an existing plan? If so, let us work for you! We are in the business of helping businesses succeed. Whether it’s through additional training, one-on-one counseling or providing the contacts and information you need, we’re here to serve you. We understand the problems small businesses face. And best of all, the services we provide are at no cost to you.